Valencia Basket celebrated its 30th anniversary with a dream season which ended with the lifting of its first Spanish League crown. The goal is to build on its success at an even higher level: the Turkish Airlines EuroLeague. Valencia signed a new coach, Txus Vidorreta, added four new faces to its roster and brought back up-and-coming swingman Alberto Abalde. It got stronger in the paint with experienced big men Tibor Pleiss and Latavious Williams. The team also signed scoring ace Erick Green and versatile forward Aaron Doornekamp. However, most of its main players are back, which promises good chemistry from the very beginning of the season. Basketball has never been more popular in Valencia and there should be a great atmosphere at every EuroLeague game played at Pabellon Fuente de San Luis. Antoine Diot and Guillem Vives are back to share the point guard duties. Diot is a reliable shooter with great poise and a high basketball IQ, who has emerged as a clutch player when needed. He is the perfect complement for the more defensive-minded Vives, who can put pressure on the ball. At age 24, Vives is a determined and reliable blue-collar guard who is still getting better. Combo guard Erick Green is expected to have a big role this season thanks to his instant offense and extra defensive intensity. Three-point threat Rafa Martinez will keep pulling the trigger from downtown and offer some very valuable experience to the younger generation. Joan Sastre is reaching the prime of his career and becoming an all-around scorer in addition to being a first-class defensive stopper. Former All-EuroLeague swingman Fernando San Emeterio should have a leading role too, especially when the team needs him in big games. Athletic swingman Alberto Abalde’s intensity will give Valencia an extra boost. 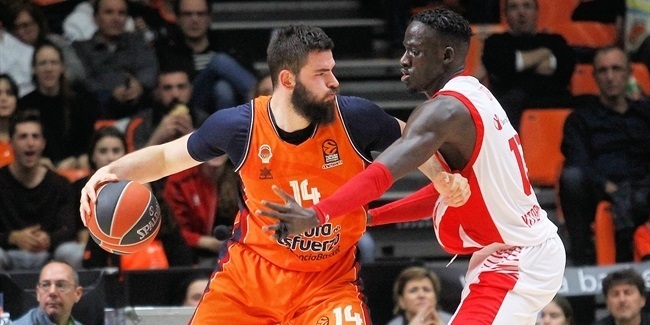 Valencia changed much of its interior rotation, but made sure to hold on to its franchise big man, Bojan Dubljevic, who is in his sixth season with the club. Dubljevic is the 7DAYS EuroCup's all-time leading scorer and returns to the EuroLeague for the first time since the 2014-15 season. A great shooter, even from downtown, Dubljevic is also deadly in the low post where he boasts an array of great moves highlighted by an effective jump hook. Aaron Doornekamp had an excellent season for Tenerife with Coach Vidorreta and wants to offer the same in Valencia: tough defense and deadly outside shooting. Will Thomas has been a perfect complement for Dubljevic as a strong, mobile big man who can also hit outside shots and excels around the basket. Tibor Pleiss’s size will change many opponents’ shots and he is an effective pick-and-roll player, too. Latavious Williams can play above the rim and change games through his explosiveness and all-around energy. As one of the best players in EuroCup history, not to mention its career leading scorer, it is time for Dubljevic to shine in the EuroLeague. Over the years, Dubljevic rejected many offers to stay in Valencia, in a city and club where he is loved and respected by the fans. Dubljevic did great in the 2014-15 EuroLeague with 15.5 points over eight games. He now returns to the competition with great maturity and eager to make a difference in the paint. He has gotten physically stronger over the years to help him make the most out of his excellent post moves. Dubljevic is also deadly from beyond the three-point line, especially from the top of the key, so opponents must find a way to slow him down if they want to have a better chance to beat the ever-dangerous Valencia. This is Valencia's fourth appearance in the EuroLeague. The club was literally one win away from reaching the Final Four both in 2005 and 2011, but did not get past the regular season in the 2014-15 season. The new format should favor Valencia, which has been almost unbeatable at home in European competitions. Keeping a core of players from last season should also benefit Valencia in the short term. Adjusting to a more-physical playing style is one of the keys for Valencia to challenge for a playoff spot because the squad has the talent to compete against anyone, anywhere. 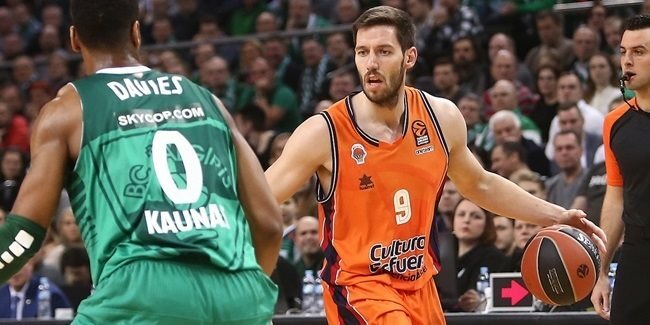 With good shooters, experienced players at all positions, great basketball tradition and an enthusiastic fan base that always stays by its team, Valencia is a welcome addition to the EuroLeague.